With a spa concept in mind, TAS DesignBuild designed Dia to feature condominiums, lofts, and townhomes around a courtyard. Playing close attention to the area’s urban morphology, TAS DesignBuild aimed to revitalize the generic offering of multi-unit homes that were available in North York. TAS DesignBuild developed DIA so that all of the project’s parts were consistent throughout. Based on a spa concept, the name, the design and the project offerings were developed to be inline with the project vision. The building design pays very close attention to the neighbourhood’s urban morphology and responds to its site and situation; allowing for three different unit types (condo units, skip-stop units and townhomes) to be seamlessly offered in one project. 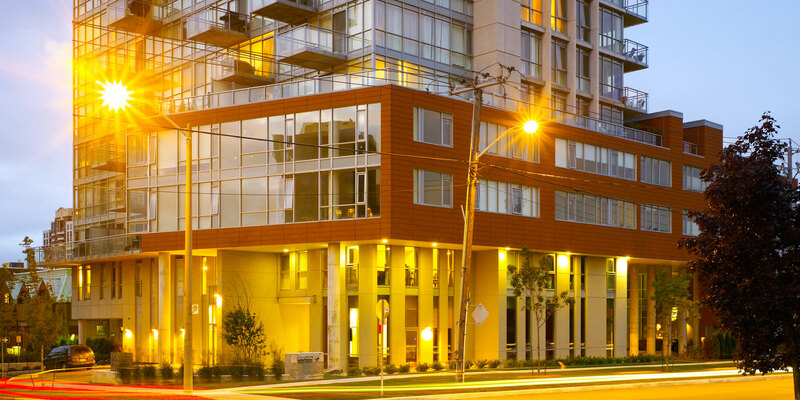 TAS DesignBuild’s DIA’s unique condominium tower provides the community with a strong modern aspect. Its streamlined look and the visual edge created by the surrounding lofts, makes it the structural core of the community. Glass faced, with extended terraces, this tower presents a majestic face to the world. Inside you’ll find a variety of suite designs – one bedroom, two bedroom, and penthouses. Designed to be flexible, the DIA suites may be spatially combined – with suites connecting vertically or horizontally to create the space you desire. Regardless of their form, the majority of suites provide inside and outside living – reflecting the quality of life designed into this outstanding community. A collection of townhomes for those who enjoy their own front door and private garage. This is ground-level living, complete with outside living space. Low-maintenance: impeccably self-contained. Designed on two smart levels, inside and out, TAS DesignBuild’s DIA townhomes are contemporary living spaces flushed with light. All that people crave in living. Light. Open plan, two stories in scope, with through views from street to inner courtyard. The lofts create a natural link between all of TAS DesignBuild’s DIA’s elements. TAS DesignBuild’s DIA spa area is on two levels, incorporating “wet” and “dry” fitness amenities.